A Queensland patio over pool, with a bamboo roof for filtered shade! Just the ticket to make the back yard more enjoyable and user friendly. This family found it hard to enjoy their back yard in summer. From lunch time onwards fierce sun streamed into the back of the house and entertaining area making it virtually unusable. 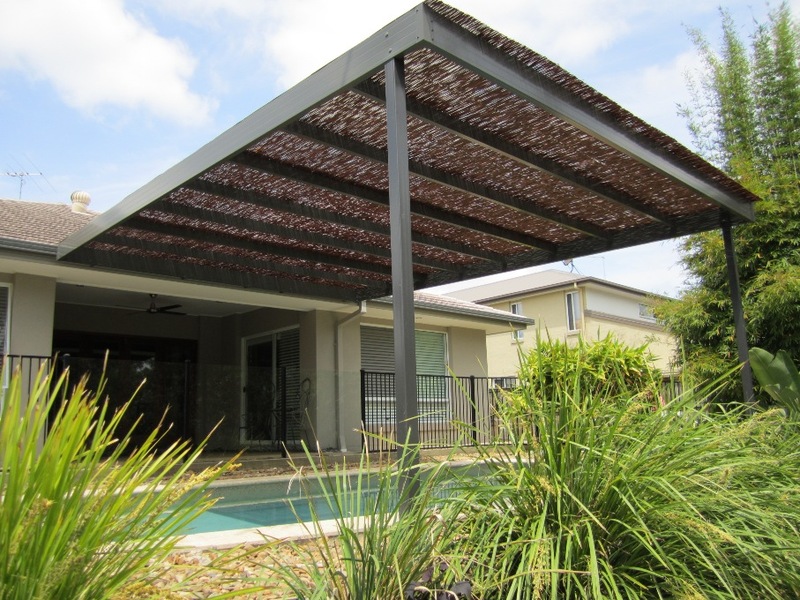 Wanting a bit of shade, and not really knowing how to achieve it, the team at Outside Concepts Brisbane South was consulted. Initially they came up with an alloy-framed awning (to avoid any rust problems) covered with pulley-operated retractable horizontal blinds. With the couple’s love of bamboo and an Asian themed yard, customers Paul & Tracey opted for a fixed bamboo screen roof to achieve the dappled light effect they were after. Using Outside Concepts’ custom engineered aluminium beams provided a flexible roofing system to carry the bamboo screening as well as polycarbonate roofing at a later stage. Several other design solutions were discussed with the customer, including free standing options and mounting the frame to the house. In order to straddle the pool, finding suitable locations for posts provided some challenges. Building the awning over the pool has certainly been worth the effort and the project has been finished just in time for summer. Owners Paul & Tracey are very happy and keen to act as referees for the good work by Tony & Lorraine Reeves. Outside Concepts Brisbane South specialises in working with customers to achieve the results that they want, within their budget, while ensuring we add style and value to the property. Call or email us today to discuss how we can help you realise your dreams and improve your lifestyle. What size is this pool patio and can u give me some idea as to how much this pictured one cost??? It was approx. 5m wide, and projected out from the house 5.9 metres. Structure was built strong enough to take polycarbonate roof sheeting at a later date, if the customer changed their minds. Customer is still very happy with the result.